The global single-use bioprocessing systems market has registered substantial growth in the last few years. Currently, an evident shift has been observed in the adoption pattern of small and medium-sized biotechnology & biopharmaceutical startups toward accepting single-use technologies and products. With rapid growth of the biotechnology and biopharmaceutical industries, manufacturers are now actively looking toward developing innovative treatment solutions which will give them not only a competitive edge over market rivals, but also help reduce the development time of new products with greater efficacy. Additionally, single-use bioprocessing systems help manufacturers and suppliers perform pilot studies at lower capital costs. Reputation of single-use technologies has been growing rapidly in research and development, precisely in drug development, although it is slowly moving from a dormant to a nascent growth stage in cGMP production of biologics. The global single-use bioprocessing systems market has been segmented based on product, application, end-use, and region. Based on product and application, bags and monoclonal antibodies segments are estimated to dominate the market during the forecast period. Proliferation in research and development activities in the pharmaceutical & biotechnology industry and rise in mergers & acquisitions which helps in adoption of new techniques in development of products are expected to drive the growth of the segments in the near future. Single-use bioreactors comprise a disposable bag instead of a typical culture vessel made from stainless steel or glass. Over the past two decades, single-use bioreactors have been in use in the biopharmaceutical industry and have made significant improvement in technology and ergonomics, due to their co-development with the users of the system. Also, advancements in sensor technology and automation have led vendors to incorporate intuitive and user-friendly controls in the apparatus. Customized products are co-developed with inputs from end-users, and since users can best describe challenges faced during usage, vendors have been able to deliver products with the best possible solution to overcome such challenges through incorporation of cutting-edge technologies in the development of the product. Increasing demand for single-use bioprocessing bags in various end-user industries across the globe is driving the market. However, apprehension over purity of the product remains a concern due to possibility of extractables and leachables from the plastic component of the bag interacting with culture components during fermentation. Vendors are thus highly focused on quality assurance of the products and in procuring of resins and plastic films. Premier companies in the global single-use bioprocessing systems market, such as, Thermo Fisher Scientific and GE Healthcare sell their bags after subjecting them to a host of tests for material and sterility-based safety. Key players operating in the global single-use bioprocessing systems market include Merck KGaA (Merck Millipore), Danaher Corporation (Pall Corporation), Sentinel Process Solutions, Sarotorius AG, Thermo Fisher Scientific, PBS Biotech, Inc., Saint-Gobain, Finesse Solutions, Eppendorf AG, and GE Healthcare. Bioprocessing is a significant part of biopharmaceutical development and production processes. Single-use bioprocessing systems, which are meant for one-time use, have captured a unique position in the biopharmaceutical and bio therapeutics industries. Biomanufacturing facilities which once housed only stainless steel equipment are paving the way for a hybrid setup which also incorporates single-use technologies. New facilities manufacturing biologics, especially CROs/CMOs and small biotechnology startups, are increasingly opting for fully single-use plants. These systems have made the production of clinical trial drugs as well as commercially manufactured drugs cost-effective and flexible. The global single-use bioprocessing systems market is expected to register double-digit growth during the forecast period from 2018 to 2026. This is attributed to lowered labor efforts, lowered capital cost, and reduction in time, money, and efforts spent on sterilization procedures. This report on the global single-use bioprocessing systems market analyzes the current and future prospects of the market. The report comprises an elaborate executive summary, including a market snapshot that provides overall information of various segments and sub-segments. The research is a combination of primary and secondary research. Detailed qualitative analysis of factors responsible for driving and restraining market growth and opportunities has been provided in the overview section. Market revenue in terms of US$ Mn for the period between 2016 and 2026 along with the compound annual growth rate (CAGR %) from 2018 to 2026 are provided for all the segments, considering 2017 as the base year. Market related factors such as technological developments, product innovation, expansion of infrastructural facilities by major & small pharmaceuticals, and historical year-on-year growth have been taken into consideration while estimating the market size. Growth rates for each segment of the global single-use bioprocessing systems market have been determined after a thorough analysis of past trends, demographics, future trends, technological developments, drug development life cycle, and regulatory requirements. These factors would help the market players to take strategic decisions in order to strengthen their positions and expand their share in the global market. 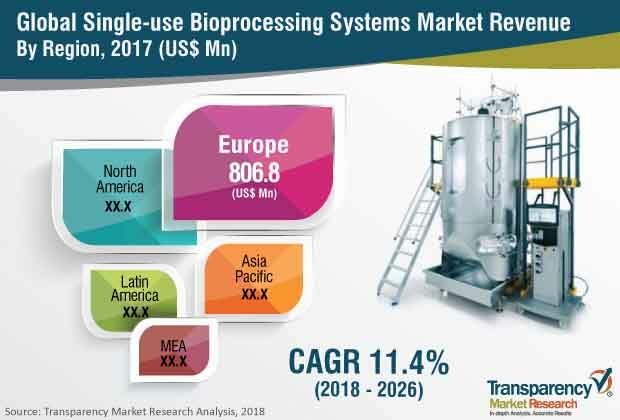 Based on product type, the global single-use bioprocessing systems market has been segmented into bioreactors & fermenters, mixers, bags, filtration devices, tubing, sampling systems, connectors & clamps, and sensors & probes. Bags and bioreactors are the most prominently used products in the global market. Major end-users of single-use bioprocessing systems include pharmaceutical organizations, biotechnology organizations, CROs & CMOs, and academic and research institutes. In terms of application, the market has been segmented into monoclonal antibody production, vaccine production, plant cell cultivation, patient specific cell therapies, and others. The others segment includes recombinant proteins, enzymes, and growth factors. The flexibility of single-use systems coupled with less chances of cross-contamination make single-use bioprocessing systems a prime purchase option for manufacturers involved in monoclonal antibody production. Geographically, the global single-use bioprocessing systems market has been segmented into five major regions: North America, Europe, Asia Pacific, Latin America, and Middle East & Africa. The regions have been divided into major countries/sub-regions. A global overview has been provided, and North America has been analyzed in depth at country as well as product, application, and end-user segment levels. North America includes the U.S. and Canada. Europe, Asia Pacific, Latin America, and Middle East & Africa have been briefly profiled at country level. Countries/sub-regions in these regions include the U.K., Germany, France, Italy, Spain, China, Japan, Australia & New Zealand, Brazil, Mexico, GCC Countries, and South Africa. The competition matrix section included in the report is likely to assist existing players to increase market shares and new companies to establish presence in the global single-use bioprocessing systems market. The report also profiles major players in the global market based on various attributes such as company overview, financial overview, SWOT analysis, key business strategies, product portfolio, and recent developments. Key companies profiled in the report include Thermo Fisher Scientific, Merck KGaA (Merck Millipore), Danaher Corporation (Pall Corporation), Sartorius AG, Eppendorf AG, GE Healthcare, PBS Biotech, Inc., Meissner Filtration Products, Finesse Solutions, Sentinel Process Solutions, and Saint-Gobain.